One of our main social events of the year is the annual Past Grand Knights Dinner. Once again we held the dinner at Villa Olivia Country Club in Bartlett, IL. Father Ted and Father Greg were honored guests in attendance as well as the widows of our fallen Knights. We thank them for sharing the evening with us as we remembered their past service and honored several of our members for their current achievements. There were several award presentations made during the business portion of the evening. Grand Knight, Loren Becht, presented Father Ted with a Knights of Columbus priest stole as a token of appreciation. Jim Kaltinger and Richard Zych were presented with the Knight of the Year award. We continued the recent tradition of awarding two Knights with this distinguished award. Unfortunately, Jim was not in attendance due to a recent death in the family. Family of the Year was presented to Chuck & Florence Graziano. 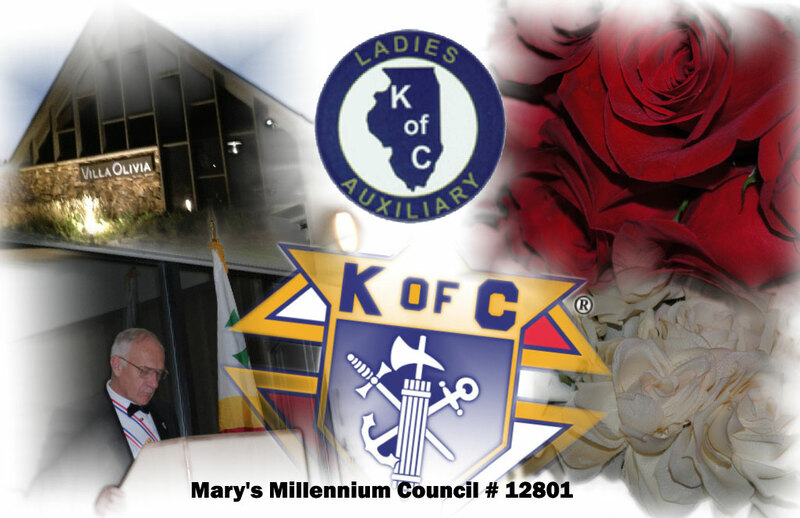 Auxiliary President, Joanne Lorkowski, presented Monica O’Neill with Lady of the Year award. Loren also presented Bill Brand with a Knights in Action award for his past service to the council. Bill is now a member of a council in Huntley.